^ My old work. These sprites were created for a shoot'em'up game of A.U.D. Studios (www.audstudios.com). So copyright goes to them. As you can see above - an uderwater units. A submarine fleet. I'm making a game, would you accept comissions? It depends. I need to know game resolution, sprite sizes, the amount of work and reward. If resolution is under 480*320, and reasonable workload — send me PM with details. 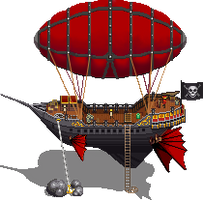 I'm interested on ships smaller than 50x44 pixels. I'm still considering making larger ships that will occupy four hexes and seven hexes. Tell me how much would cost for 5 small ships, 3 medium and 1 large using one style. That would be 50 small ships, 30 medium and 10 large in total. There will ne no need to rush, actually you can take your time to do it. This just blew me away! All the little detailing and colors! And the machines actually look like they are made of working structures. These are great! Nice work, even though it's old you say. some day there should to have an book or site only dedicated to that peculiar and beautiful art. with some of your works posted too !!! Keep up the amazing Work !! !